Okay, so really I made two. Okay, so really I’ve made lots, but I’m trying not to dwell on them. I’m only going to dwell on these two and for only as long as it takes me to get through this post. Then I’m done, moving on, getting over it. 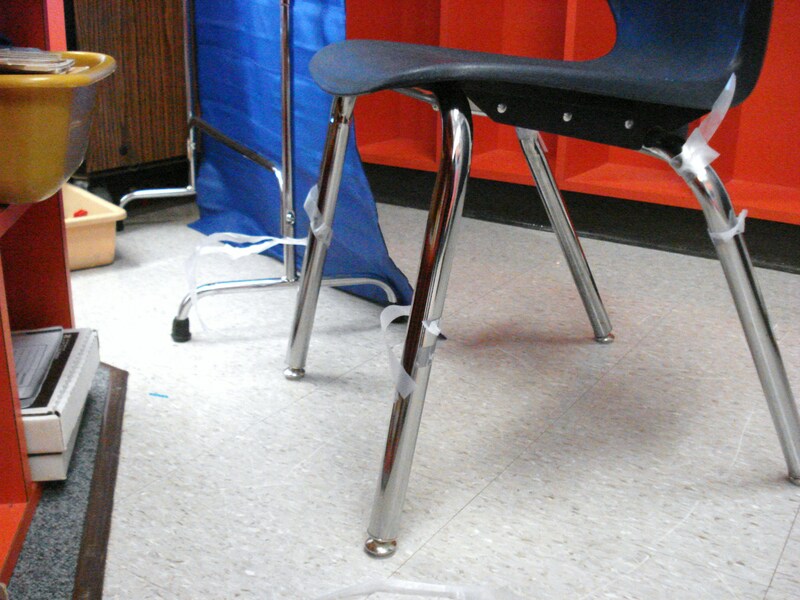 I don’t know how well you can see it, but there’s a ridiculous amount of Scotch tape stuck to the legs of this chair. One of my wingnuts taped another of my wingnuts to the chair using my last roll of Scotch tape. I’d been talking to my student teacher about a lesson plan she’d taught the day before. I’d meant for it to be a quick five-minute conversation, but it turned into 15. Towards the end, we heard what sounded like muffled shouts of glee. Like, seriously, you’re shouting for glee, but someone’s got a hand over your mouth or is covering your face with a pillow. Why either of those would induce glee is not something I can imagine right now. Wingnut 1 and Wingnut 2 had been playing on the other side of a shelf of cubbies for most of our conversation. When I heard the strange “I’m trapped under a pillow but I’m really excited about it” sounds, I looked around for them and realized they were in the one spot in the room where they couldn’t be seen. “Hey, dudes! Get out here, please!” I called. There were some light unsticking sounds and then the sounds of little feet scurrying. When they finally presented themselves, one looked happy, but guilty. The other looked happy, but covered in Scotch tape from forehead to eyebrow and all down his cheeks. This would explain what muffled the giggles. Wingnut 2 said that Wingnut 1 had asked him to do it. “Is Wingnut 1 the boss of you?” I asked. Actually I think I said something like “king of your life” or “director of your days.” I’m not super fond of the phrase “boss of you.” It just doesn’t sound right. So, moving on from my personal preferences regarding the English language, I ended up sitting them down for a long chat. Wingnut 1 has had many, many chats with me. It’s to the point now that he literally almost cries if I say, “Hey, friend, we need to have a little chat.” Even if it’s said in a cheerful tone. I’m taking a page from my maternal grandfather’s book. From what I hear, death by lecture was his consequence of choice when raising my mom and her siblings. That and boxing out their differences on the front lawn, but that’s not really an option in the public school setting. Something I realize I’ve said many, many times since I began teaching is, “I see that you’d really like to not be here right now and that you’d rather not have this conversation. I’d really love to never have to talk to you about this again. For your entire recess and my entire planning time. The way to make that happen is to never do that again. Do it again, and we get to repeat this entire process, which is no fun for anyone.” Never do it again or just get smart enough to never get caught again, either way we all get our recess back. 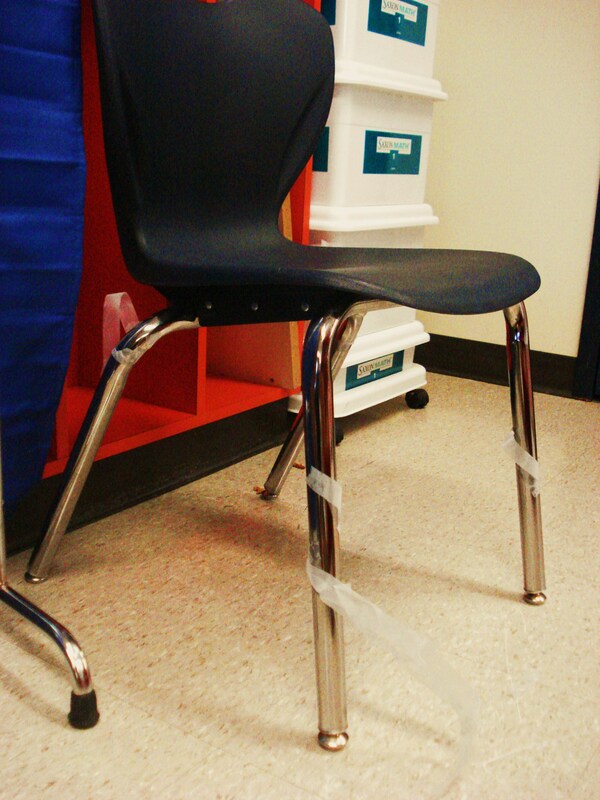 What I was hoping they’d never do again this time was use all my classroom materials to tape their peers to the chairs hostage-style. I still can’t find that roll of tape. When I began the conversation, I said, “Okay, friends. Two mistakes were made here today. One by me and one by you. I let my conversation go longer than I’d meant to and I let your free time go too long. I didn’t give you any directions.” Then we talked about their mistake and I had them process through what an appropriate choice would have been by drawing four good free time choices (not involving any adhesives). It worked out. Not much harm done, except for maybe a couple of totally unnecessary eyebrows that I’m sure no one will miss. Are we ready to move on? Mistake #2 — I bought a Costco-sized chunk of gorgonzola cheese from, um, Costco. Who on earth, besides a caterer or the Gorgonzola Cheese Society of America (or maybe the Americas, including Canada and South America) needs that much gorgonzola in her life? What was I thinking? Probably I was thinking it was a different cheese, like cambezola, that I’d tried at a gathering on crackers and had really, really liked. Probably I’d gotten confused because when someone said cambezola I thought gorgonzola because I’d had that with chicken at a wedding once a few years ago and had enjoyed it. I tried the cambezola because I’d thought about how trying gorgonzola had worked out ok that one time in that tiny amount diluted by all that protein and sauce. And then I went to Costco a month after that, saw the gorgonzola and thought it was what had been spread on my crackers and bought a chunk the size of my face. I also bought pears because somewhere I’d heard that pear and gorgonzola were something people put on salads and that if you could do that, why couldn’t I just cut some chunks of cheese and eat them with my pears? That sounds like a snack a sophisticated European woman would sit down for, right? I tried it. It was ok. Gorgonzola is a really strong-tasting cheese, though, and I had a hard time getting through the one slice I’d cut for myself. Then I woke up at about 1 AM with some serious tummy issues. I was doubled-over, praying to throw up. Is that TMI? Whatever. I need your sympathies, people. And besides, I didn’t actually throw up. I wish I had, but it didn’t work out that way. Sleep didn’t happen for me that night and I had to call in for a sub for that day, the first day back from winter break. I blame the gorgonzola. So now I have this giant chunk of cheese sitting in my fridge and a ton of uncertainty surrounding exactly what to do with it. I’ve tried these two things: a pizza and a pasta. 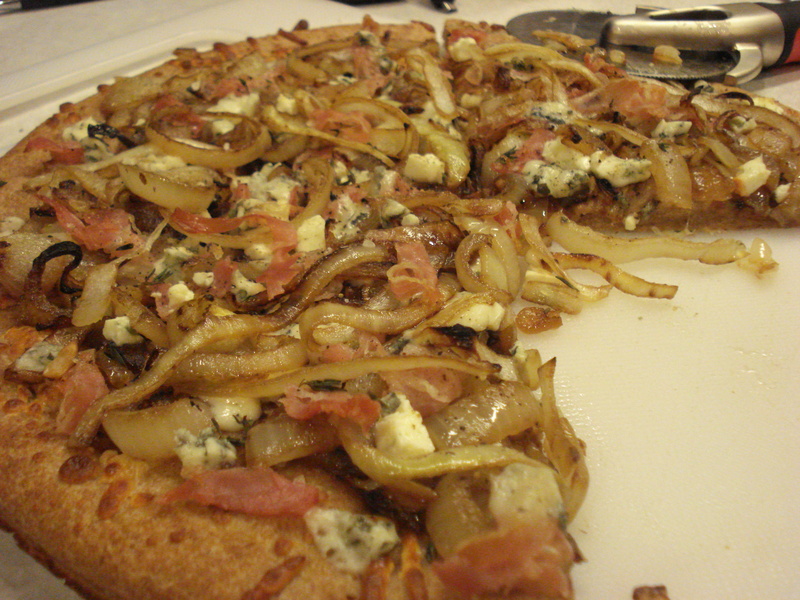 It is made up of a whole wheat Boboli pizza crust (better crusts can be home-made, for sure, but I rarely have the patience to let things rise), caramelized onions, pancetta, gorgonzola, and a bit of thyme sprinkled over the top. In the spirit of tooting my own horn, that thing was delicious. Less gorgonzola was used on this whole pizza than what I ate that night with the pear (which honestly was maybe a little larger than a reasonable slice of cheddar). 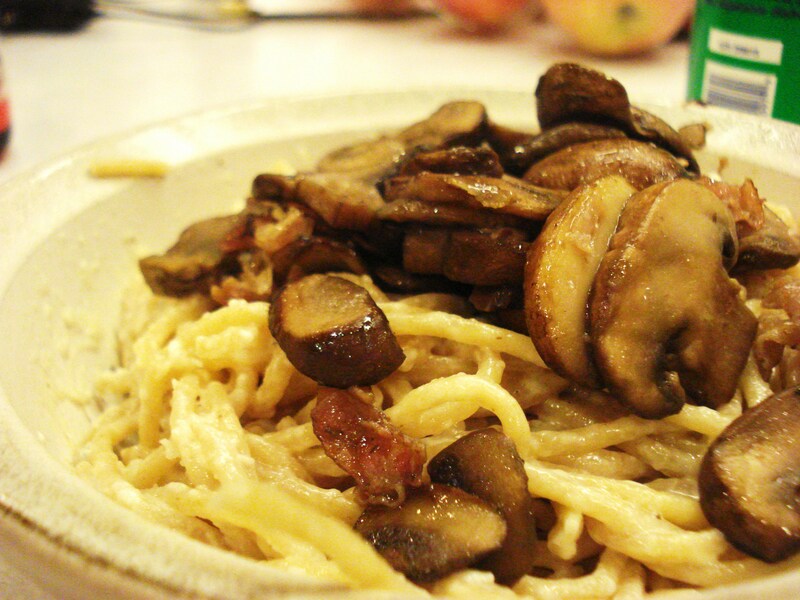 My plan was to combine baby portobello mushrooms and the rest of the pancetta with a recipe I found on The Pioneer Woman’s site: Pasta ai Quattro Formaggi. It looks very easy and manageable, and probably would have been if I hadn’t decided to add the mushrooms and pancetta without actually being sure of my timing. My pasta is kind of mushy because I forgot to set the timer and then I scalded the milk on accident and had to dump it out and reheat some more. All this meant that it didn’t come together exactly as hers seems to have. I used these four cheeses: parmesan (like she does), fontina (like she does), goat cheese (like she does), and gorgonzola (because I’m trapped under a heavy mountain of moldy cheese and am determined to cook my way out). It’s yummy and cheesy. I’ll try it again sometime. Probably sometime soon because now on top of all my gorgonzola, I also have parmesan, fontina, and goat cheese. That’s so much dairy for one girl to incorporate into her life. Besides, I’m already completely committed to Greek yogurt. On the upside, though, goat cheese is creamy heaven, in case you were wondering. And, because I’m sure you’re curious, I’ve used probably 15% of the huge-mondo-sized brick of moldy cheese I bought. What on this earth am I going to do with the rest of it? If you were so inclined, I’m sure you could search back through this whole mess and find several more mistakes I’ve made recently. There’s probably a long list in there. If you choose to spend your time doing that, I guess that’s up to you. Please don’t share it with me, though. The weight of the gorgonzola is already crushing my spirit. I have learned a couple of things, though, besides that goat cheese and my taste buds were destined to love eachother from the beginning of time. Thing 1: Never leave a wingnut unattended. It’s a sticky mess. Thing 2: Never buy a piece of cheese that, should it happen to fall from a high place, could pin your cat to the floor. This is for your own good, people. Don’t make my mistakes. Amanda and I are pretty smart cookies, I must say. Sequester us in a room with the Food Network and you had better just stand back. Things could get dangerous. Deliciously dangerous. So there we were, in the living room, basking in the sparkle of the 3/4 Christmas tree and watching The Best Thing I Ever Ate on the Food Network. It’s a show where chefs and famous foodie folks tell you about the best things they’ve ever eaten according to the theme of that episode (comfort food, fried food, seafood, etc. ), how it’s made, and where you can eat it, too. Tonight it was about dessert. 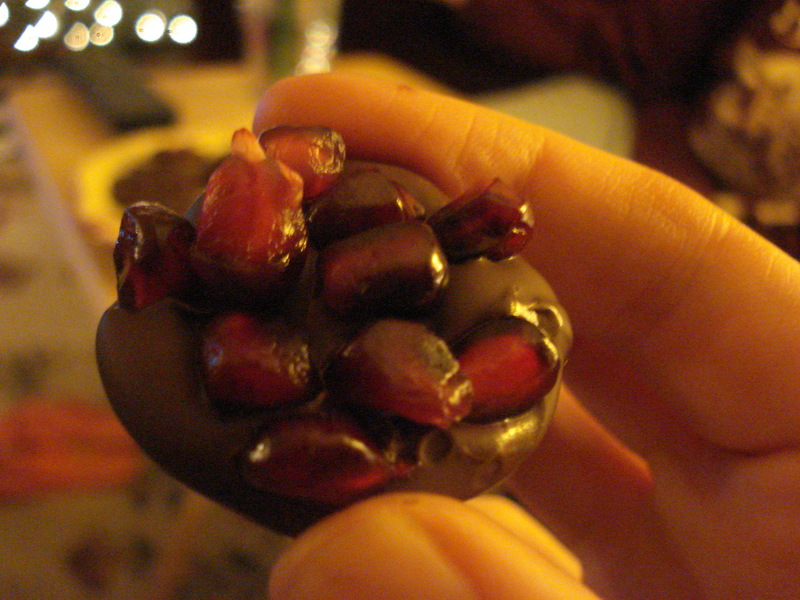 I said something to Amanda about how, although I love the show, I shouldn’t be watching it because I’d already decided that my after-dinner treat would be pomegranate and now all I wanted was something covered in chocolate. 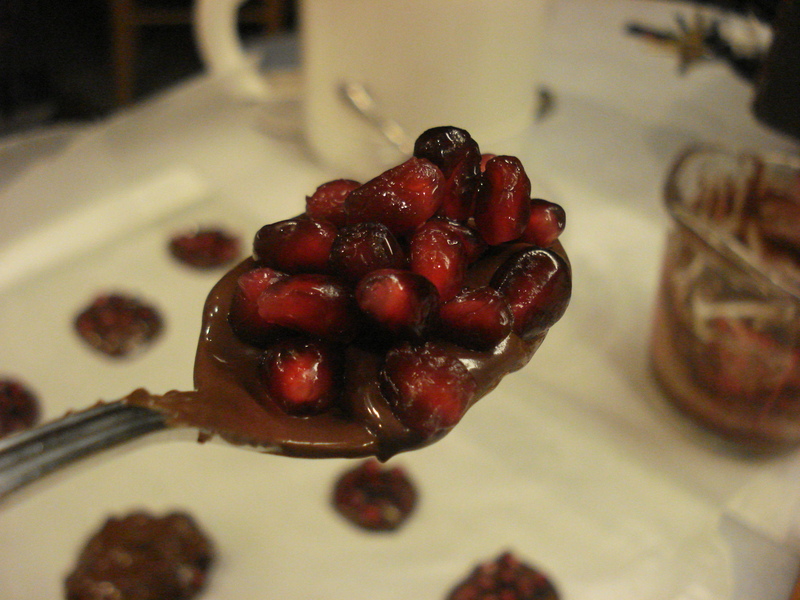 Her idea: cover the pomegranate in chocolate. That’s why we’re friends, Amanda and I. She’s got answers when I’ve got questions. She’s a gem. We chatted about it for awhile, mulled over our options. 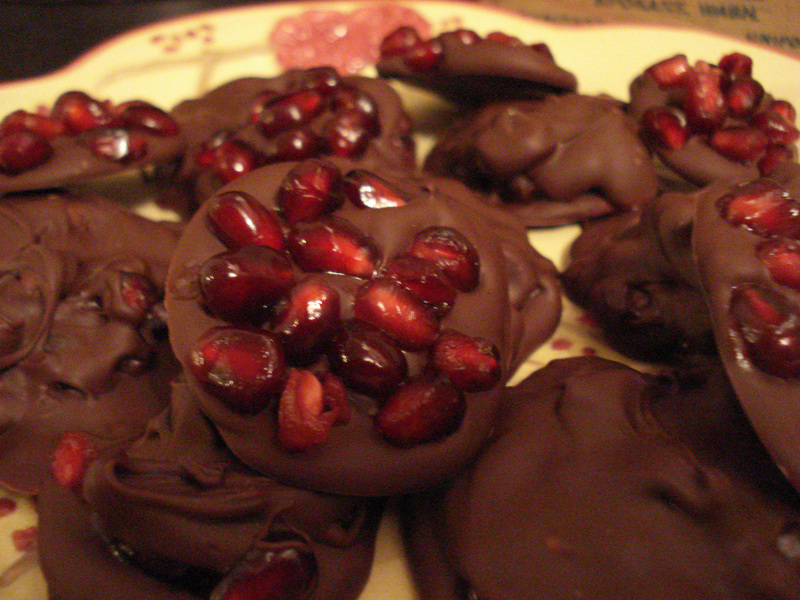 I could just pop the pomegranate in my mouth and chase it with some chocolate chips or I could put the arils in a dish and drizzle melted chocolate over them (not an altogether bad idea at all). 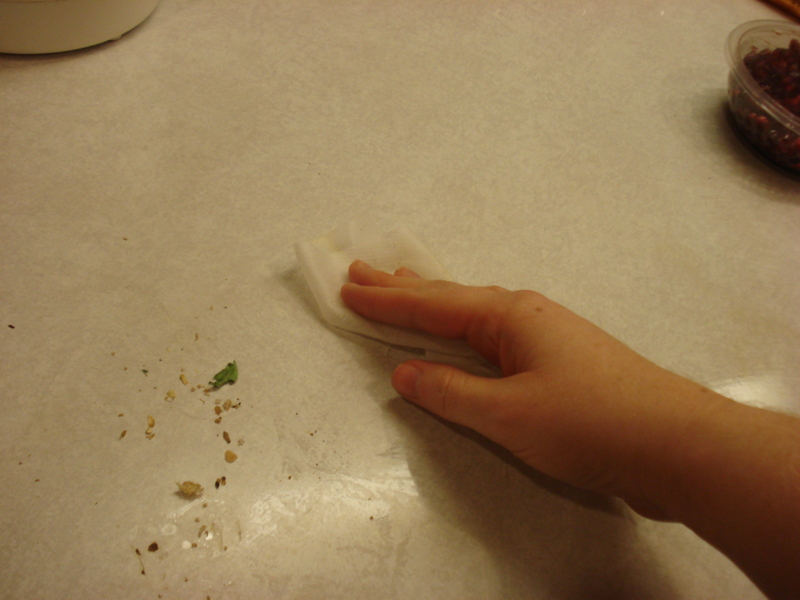 Step 1: Wipe down the counter. Girl, your counter is gross. 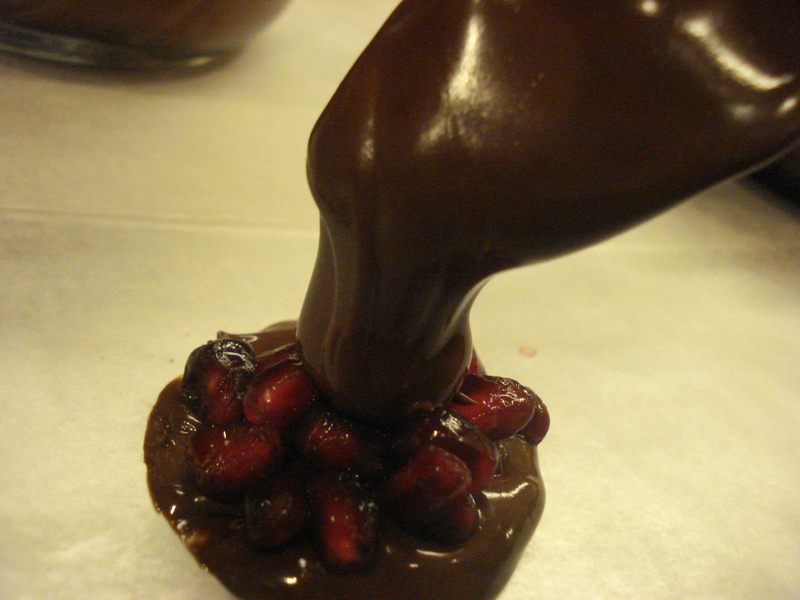 I used Ghirardelli Semi-Sweet Chocolate Chips. We’re a gourmet household, for sure. Psych! (Whenever I say or think “psych!” I instantly picture riding the school bus in second grade, probably because that’s the last time that exclamation was appropriate.) We’re not really gourmet, I eat out of a lot of cans. We just are big chocolate chip fans. 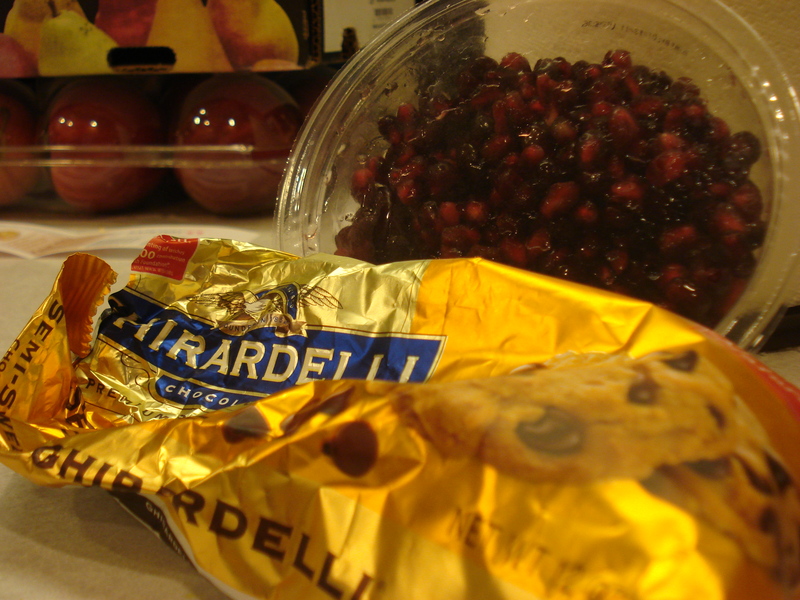 Also, you should know that Costco sells little bowls of pomegranate arils already separate from the fruit. It’s magical. You clearly do not need the little bowl of pre-separated arils to make the treat I’m about to show you, but it’s what I had on hand because one gets tossed into my cart every time I walk through Costco’s doors. Clearing out a whole little dish in minutes is not uncommon. In fact, it was my plan tonight before Rocco Dispirito took over my TV and went all crazy-eyed about a chocolate mousse. Dang it, Rocco. 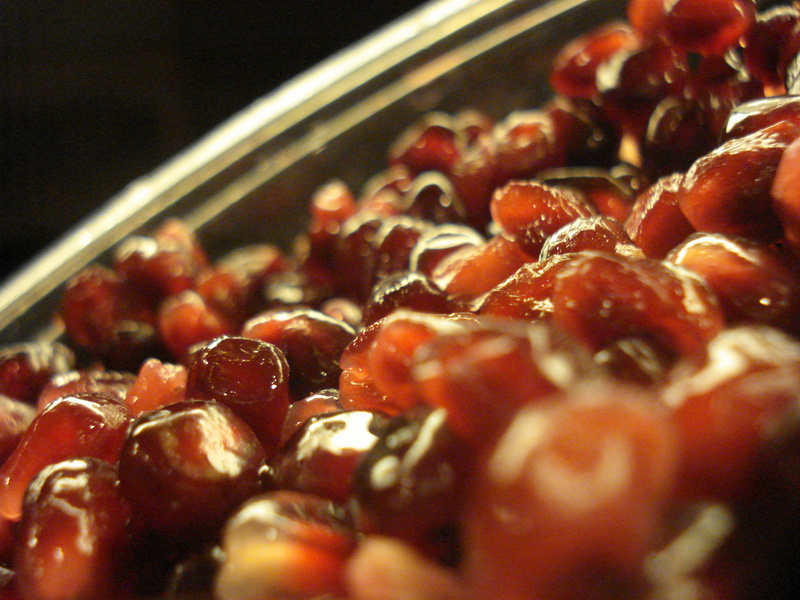 Should you happen to find yourself in possession of a whole pomegranate and not a handy little bowl of arils, here’s a little direction on how to get into one of those guys without having to drop-cloth your entire kitchen: How to Open a Pomegranate, on Tasty Kitchen. 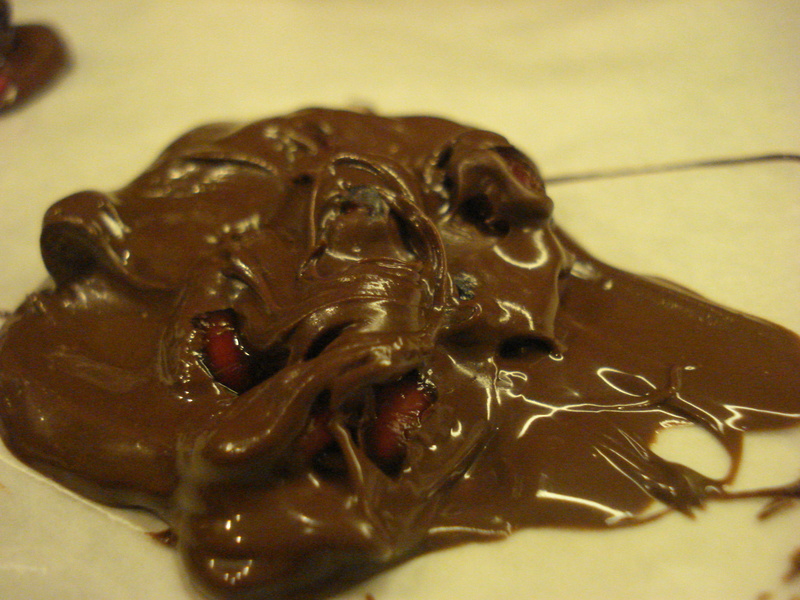 Anywho, step 3: Melt your chocolate chips. Dump your chips in something microwave-safe. I microwaved mine at 30 and 15 second intervals, checking on and stirring the little dudes until I was happy with their meltediness. It’s a word. Because I said so. Still some lumpy-bumpy chips in there. Hey! Don’t lick that! You’ve still got some stirrin’ to do! 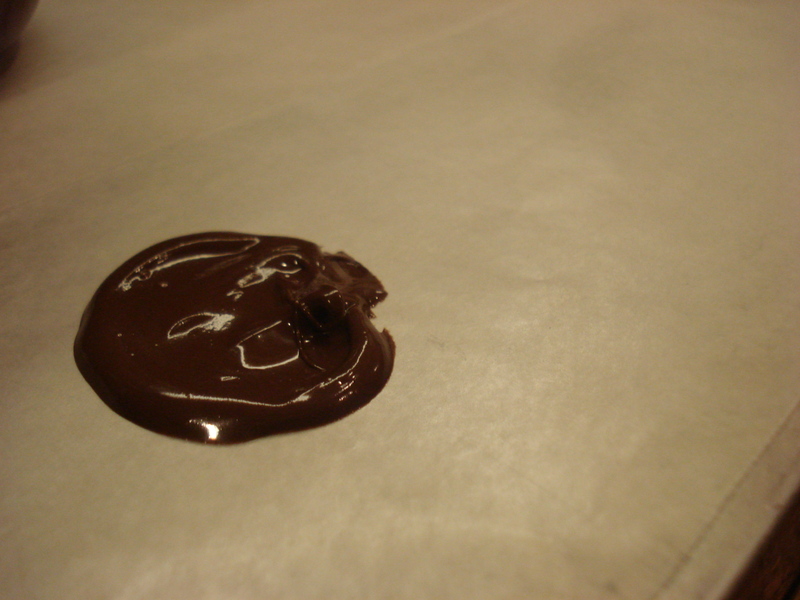 When the chocolate is as smooth as you’d like it, all meltedy with no lumpy-bumpies, step 4 is to make little smoodgies of chocolate on some wax paper you’ve laid out. I made one smoodgie at a time. 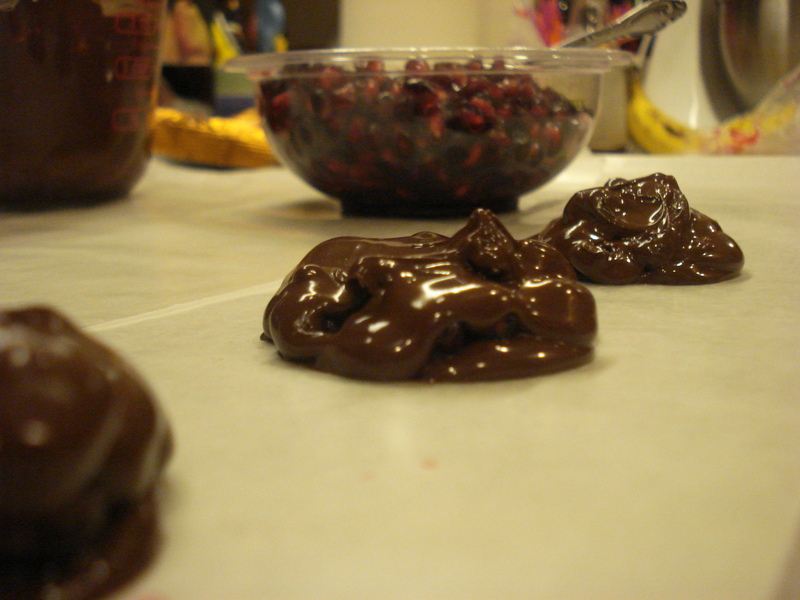 Then, after each smoodgie is spread, I scattered some arils on top. That’ll be Step 5. That’s a poorly done example of aril scattering. I used a spoon at first and the little dudes rolled all over. After that I just grabbed some with my fingers. 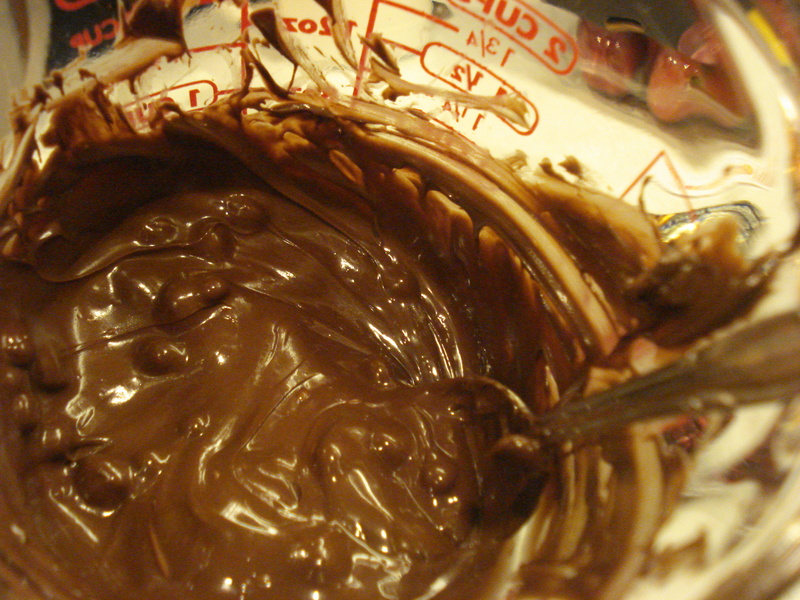 Step 6: Top the aril-scattered chocolate smoodgie with more chocolate. That one looks a little like it came from a wild animal with a pomegranate-heavy diet. Meh. There’s a learning curve, I guess. What’s it say about me that I jacked up the execution of a two-ingredient recipe? Don’t answer that. After that little mishap, I decided that maybe whatever it was I was making didn’t actually need the chocolate topper. 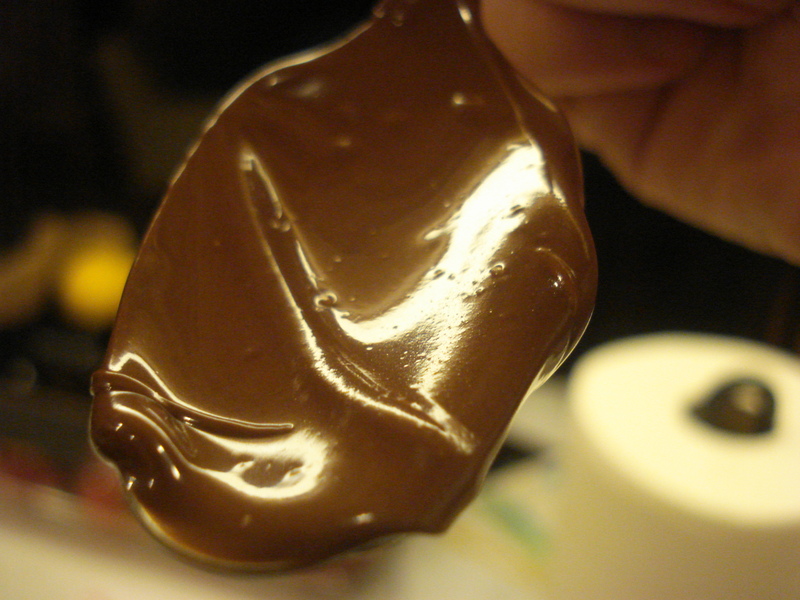 The chocolate, I’d thought, was goopy enough that if I didn’t spread the smoodgies so thinly I could probably just gently push the arils into the chocolate and they’d stay perfectly fine. And I ate it. Deeeelightful. Definitely a sign of good things to come. 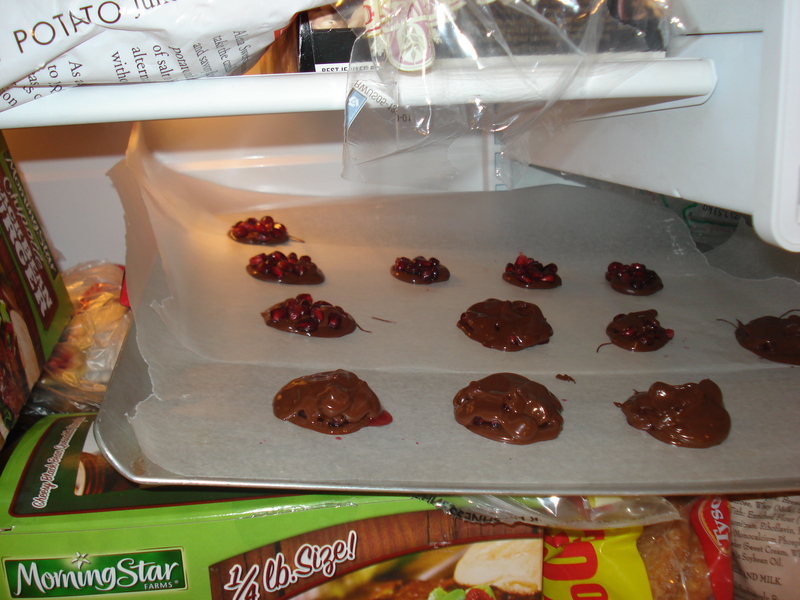 Step whatever-number-comes-next: Put them in the freezer or fridge or wherever to let them set up. It took about five minutes for them to harden in the freezer. Then, ta-da! 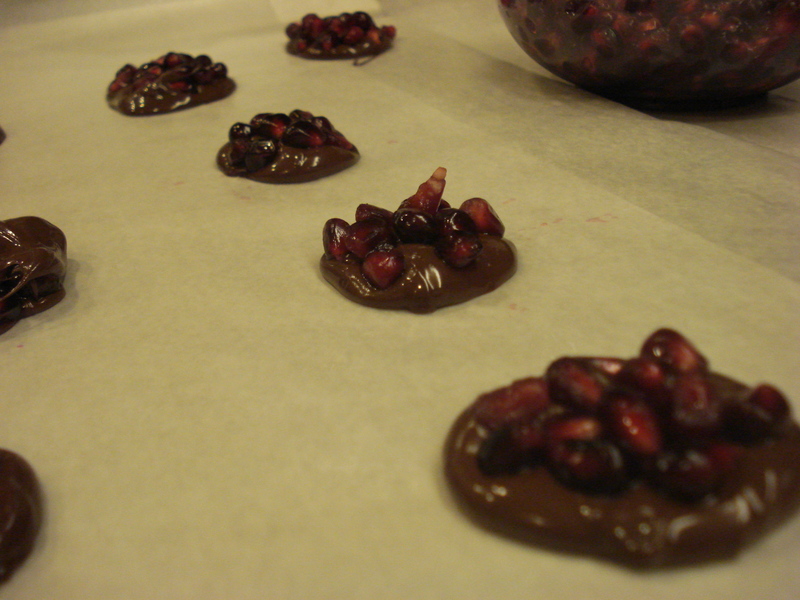 Chocolate-covered pomegranate arils! They are a strange combination of refreshing and chocolately, to be sure. It works, though. It works well. 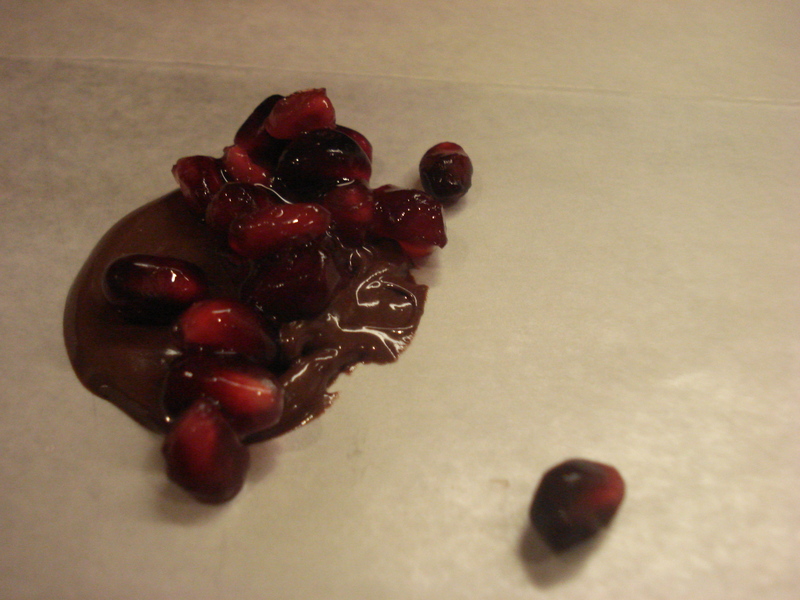 The pomegranate is a little tart and crunchy and the chocolate is just so purely chocolatey and smooth. 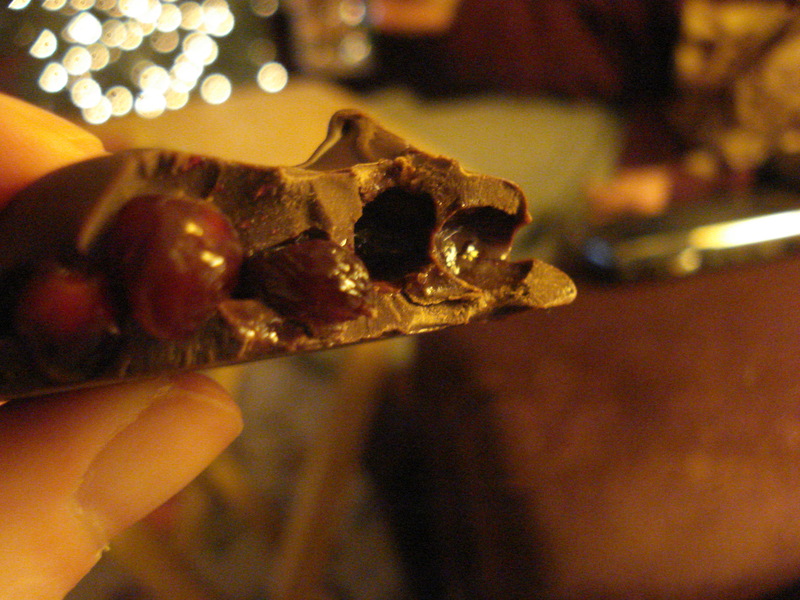 Your teeth sink into the chocolate and the little arils burst. Kirstin was a little surprised when I ambushed her into trying them. The arils go “Pew-pew-pew!” in your mouth, she said. I think I prefer the ones without the extra chocolate on top. 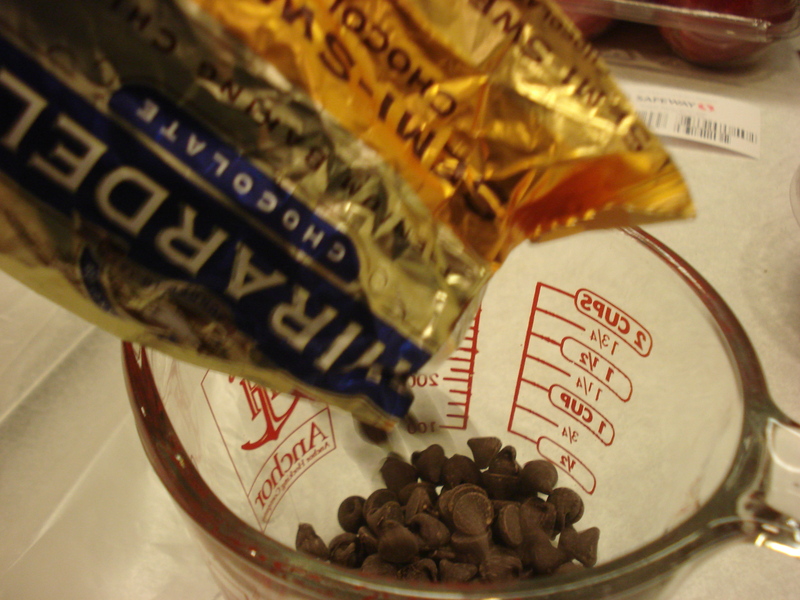 There’s a greater aril-to-chocolate ratio. What you prefer would totally depend on what you prefer…are you looking for a chocolate-heavy snack or do you want more fruit? Who’d have thought a little meltediness, some smoodgies, and food that goes “pew-pew-pew” in your mouth could be so delicious?